In real life, Seth MacFarlane is seemingly a man of a million talents, but in A Million Ways to Die in the West, he is just a man…a man devoid of a backbone by 1882 American Old West standards. MacFarlane stars as Albert Stark, an aforementioned individual making a below average living in the frontier, which is an absolute drag of a place to live in. The only thing that makes his situation bearable is the company of his girlfriend, Louise (Amanda Seyfried). As these things go, Louise tires of Albert and decides to end things with the poor sap after he shows cowardice before a quick draw. Luckily, Albert’s long depressive stupor is ended when a beautiful mystery woman named Anna (Charlize Theron) comes into town. Out of character during a ruckus, Albert saves Anna’s life, and the two strike a liking to each other. Unbeknownst to him, Anna is actually married, and not just to some nobody. 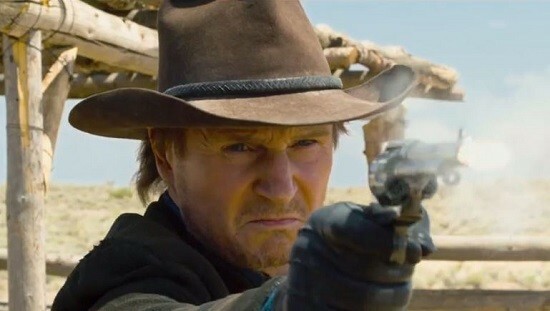 No, this guy is Clinch Leatherwood (Liam Neeson), the best and most dangerous shot in the whole Wild West. 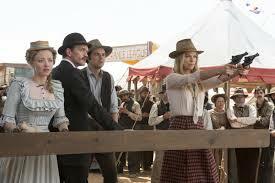 A Million Ways to Die in the West should really be prefaced by Seth MacFarlane Presents. . . If you don’t know by now, the man credited with Family Guy’s success and bringing Ted to life not only stars here, but also produces, writes, and directs. What does this all result in? A movie with no true cohesion, and one in which too much responsibility was bestowed upon one man. A comedy’s first and sometimes only goal is to be consistently funny. This is not easy, seeing that what tickles one man’s funny bone may fail to leave a mark on another’s. With A Million Ways though, I cannot remember the last time I was hoping, waiting, and wishing for jokes and gags to genuinely make me laugh. Speaking for most of those in my theater, it appeared my sentiment was shared. As it stands, only one scene in my opinion occurring in the middle was a legit funny moment, which is a shame. Because on paper, this is a solid cast, which is something I’ll come back to later. The problem essentially comes down to lazy writing and a dependence on overused gross out gags, fart, and Indian jokes. There isn’t much of a story really, just comedy sketches draped in Old West garb barely tied together. Early on, it becomes apparent that the people with the most creative power in this (read: Seth MacFarlane) maybe believed that the setting of the Old West would “sell” itself from a humor standpoint, and all that was needed as a supplement to this backdrop is a few random scenes interspersed with strong language and revolting moments. 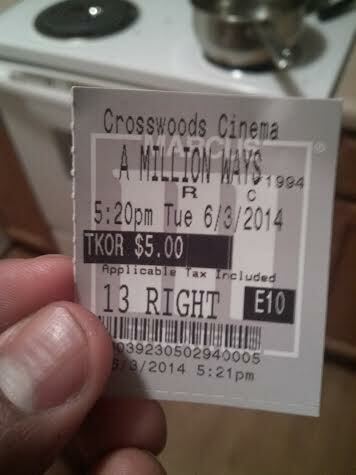 Yes, this is an R rated comedy film, so a high level of raunch is expected, including the common fare just described. These jokes are fine in doses, but when it becomes what the well consists of, well, the film gets old very quickly, which in turn makes the film feel a lot longer than it should be. Not necessarily featuring big stalwarts in comedy aside from Seth, still A Million Ways is comprised of well known actors who do their best to make it better than what is presented to them. Charlize Theron shines brightest as Anna, who generally looks she she is having fun and is easily the most likable and appealing character throughout. Sadly, this is a major issue being that Seth’s Albert is the character we are supposed to pull for and like. At length, I am unsure of whether his grating role is a result of the lazy writing, or if it is just he himself who cannot carry the weight. It is probably the latter with a bit of the former mixed in. The film is undoubtedly a comedy, but there are instances of Western drama sprinkled across, and when Seth actually has to act, it isn’t believable. He appears to be in over his head when these times come up. Additionally, the whining act becomes played out, to the point where (Spoiler) I actually wanted Liam’s character to shoot and kill him in the end climax. Not exactly what I should be rooting for. Played by Neeson, Clinch is a good antagonist, but one that is also forgotten for a large chunk of the movie, so his presence is sort of nonexistent. Giovanni Ribisi plays off of Sarah Silverman in a side story that wears out its welcome immediately. Amanda Seyfried and Neil Patrick Harris fill the secondary villain roles, and aren’t particularly memorable in doing so, but NPH may be the funniest character as a whole. Similar to Family Guy, there are random occurrences and bit players unrelated to the main tale that are supposed to inject laughs. Just know it works better in animation than in a live feature. The biggest positive ends up being the setting, from a visual sense. It appears that tons of research and hard work was done to make this look like the old frontier, from rinky-dink saloons to clothing worn, so kudos to that. However, a successful setting does not solely make a successful film, especially a comedy. There may be a million ways to die in the West, but side splitting laughter isn’t one of them. Photo credits go to collider.com, whysoblu.com, & http://www.evoke.ie. Reader’s/Followers note: Hey all, I will be on vacation starting late Thursday-June 15th, and I will most likely be without Internet, so new postings are not likely. If I somehow do post a review, expect something older. When I do return, I will be a bit behind, but I do plan on checking out and reviewing Edge of Tomorrow, How to Train Your Dragon 2, 22 Jump Street, The Signal, and maybe The Fault in Our Stars. Thanks all for reading and supporting my blog! Wish I laughed more, but after awhile, it felt like MacFarlane was using the same joke, over and over again, and it hardly ever worked. Just seemed like an overlong episode of Family Guy. Good review. It became really old really fast, didn’t it? Thanks for the comment! Another one I need to catch up on – although I’ll probably wait now until I can get it on demand. Shame it’s getting some pretty terrible reviews – with this cast it should have been so much better. To be honest Neeson and Theron are the best things about this film. I do feel that MacFarlane is stretched as a leading man but above all it just wasn’t that funny. But you know comedy, may be best to wait for demand.